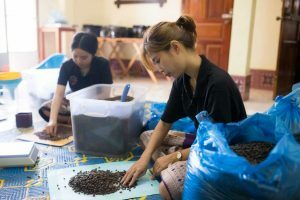 Top-notch riverside cafes have much to recommend them, but when it comes to Luang Prabang’s Saffron Coffee, everything starts with the coffee. 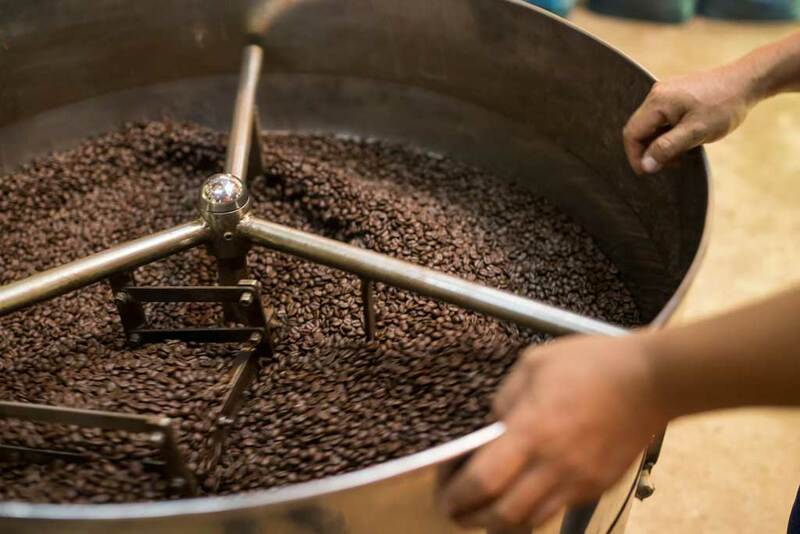 From seedling to plant, from cherry to bean, from roaster to packaging, and from there to an espresso machine, French press, or Aeropress, it’s the coffee itself that’s the whole point. There is nothing quite like taking that first sip of a coffee that you know has been lovingly crafted, both by nature and by countless expert hands, before it has made its way into your cup. And when it comes to the physical, the unspoiled view of the Mekong just over the street – sun-lit or rain-drenched, depending on the season – wending its way lazily along a riverbank that makes up the street-side of downtown Luang Prabang, doesn’t hurt. And nor does the comfy interior, with window-bench seating, WiFi, large and small tables, a counter cabinet laden with sweet treats and menu featuring gingerbread pancakes and iced Cascara-ginger tea (sipped through environmentally-responsible bamboo straws). 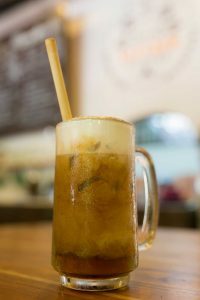 Café cool – not to mention caffeinated excellence – has finally made it to Luang Prabang, and it has taken a surprisingly long time, given the town has been on worldwide lists of top travel destinations since the early 2000s. 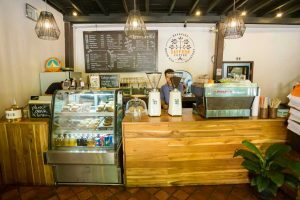 In fact, says director Todd Moore, Saffron Coffee (the company), selling produce from local villages around northern Laos, has existed for the past 10 years, with a café shopfront (Saffron’s Espresso, Brew Bar, and Roastery) as a conduit for promoting selling coffee. 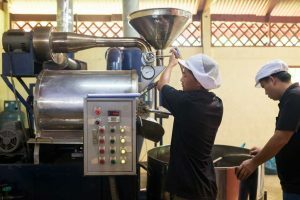 But while the current model of buying coffee from local farmers at higher-than-average prices and supporting them through the cultivation and harvest process has long been part of the company’s ethos, the notion of a top-notch café fronting the business has not. 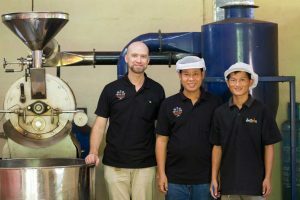 When Moore moved from the United States to Luang Prabang with his family in 2010, the company was being run by its founder, another American, David Dale. 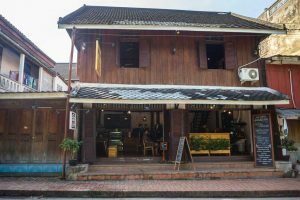 The café itself, while occupying a prime spot on the Mekong bank in the centre of town, was not a priority for the business of selling coffee. 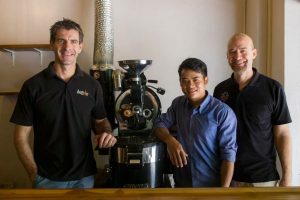 Dale left Laos in 2016, leaving Moore in charge, alongside his new staff, Australian Derek Smith, who has also shipped his young family to this corner of the world to devote their lives to coffee. Together, the two have transformed the Saffron shopfront – which happened to serve coffee – into a bona fide destination. “It’s the same coffee company, but we just re-envisioned, repurposed, and refocused the cafe,” Smith says. And as a local enterprise, Saffron is involved with various community initiatives (such as the regular blood drive and fundraising for a local children’s hospital) and has also teamed up with several non-government organisations, including Oxfam, the Wildlife Conservation Society and World Vision, to promote the growing of coffee among northern farmers. “Everything we’re trying to do is with our own profit rather than going and borrowing money, so the more partnerships that we can make, the better, and the more that we can work with farmers, the more farmers we can work with, the more people we can help. So we’re profitable, but we can only do so much with that profit,” Moore says. 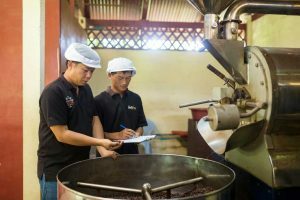 He and his team – made up almost entirely of local Lao, from baristas and wait staff to roasters and sorters – are heavily involved in the entire life of each coffee plant, which at this stage come mostly from the north of Laos, in Luang Prabang province, Phongsaly, Xiengkhouang and Houaphan. This involves educating farmers as to how to grow shade, maintain plantations, when to pick the coffee cherries, and how to sort the viable from the over-ripe or malformed. “We have 750-800 families that grow coffee that we buy from, so I think our reach is fairly good,” Moore says. And this kind of care and consideration extends right up to the customer. 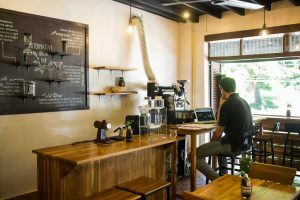 In an era in which coffee – at least in the West – is being fetishised to an extraordinary degree, a visit to Saffron Coffee’s Espresso, Brew Bar, and Roastery is an experience that is now carefully curated to appeal to even the most discerning coffee drinker. 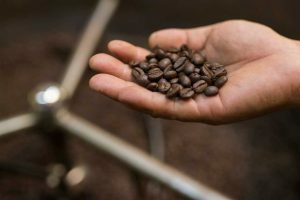 With tastings and tours to its roasting factory 15 minutes out of town, Saffron wants everyone to experience the product as a journey, of cultivation, preparation, taste and smell, rather than simply a shorthand for morning energy booster or casual catch-ups.